The car is packed and ready to roll, you just need your passengers. It is now time to enroll your students. Two methods of student enrollment are available, as discussed previously. Remember: These methods are not mutually exclusive; however, you should choose one and stick with it as best you can. If you have a roster full of students and you wish to enroll them all at once, use this step. You will need the roster in an Excel spreadsheet (.xlsx) file. Locate this template on the Students tab. From the Course Homepage click the Students tab. The empty course roster appears along with Import from Excel spreadsheet. 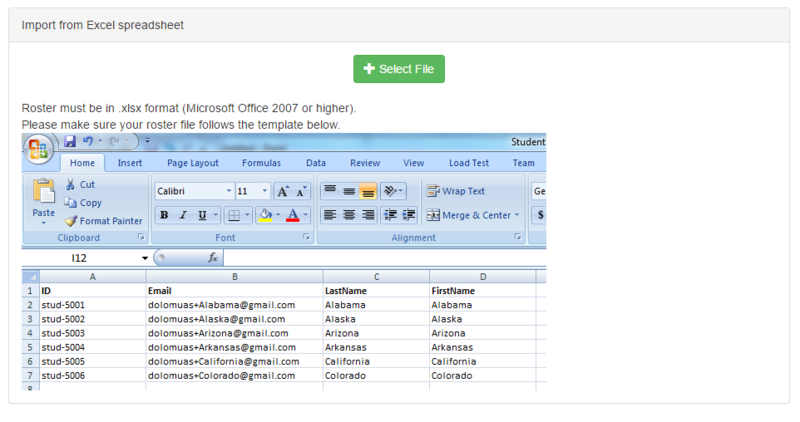 Once the roster spreadsheet format fits the one above, upload it using the Select File button, find the spreadsheet and click Open. If Mobius does not detect an error, the file will upload successfully and all of the students will be enrolled in the course. While the last four digits of the students ID is recommended as their Mobius SLIP External ID, you may use any code or phrase here. This is one of the advantages over Self-enrollment, which limits students to only the last four digits. It is still advisable to not store their entire 7-or 9-digit ID if possible. Uploading student’s emails creates an account for them in Mobius, if they do not already have one. Please provide students without accounts previously the instructions to create their password, by clicking ‘I don’t know my password’ from the login screen and follow the password reset wizard. Students enrolled via roster upload will be sent an email when the course opens or will be sent an email immediately, if the course is already open. If students must be added later, and you choose to do so via roster upload, simply enter the new students’ information in the same Excel spreadsheet format and upload the file again. The roster will be updated with the new students. Self-enrollment code deletion (turning off the self-enrollment feature) is not required or necessary when using roster upload. Retrieve the self-enrollment code assigned at course setup. If you have forgotten the code or did not write it down, it can be retrieved from the Course Settings tab from the Course Homepage. Note: If this feature was previously turned off (the code deleted) and you wish to use the feature, simply enter a code, course_semester_section format preferred. Include the Self-enrollment code in your course syllabus and on the course information page in your LMS. Students enroll themselves once they are given the code. Make sure they have plenty of time between the course open date and the first Submission deadline. Usually after the beginning of the semester, before the Add/Drop deadline at most institutions, students decide that they do not want to be in a course and switch. The method of enrolling them after the course starts was discussed above. In this section, the topic of Forfeited Permission SLIPs, Dropping a Student is covered, as well as some tips when adding late students. If a student drops your course, they should also be removed from the Mobius SLIP roster. To drop a student, click the ‘D’ beside their name. If you accidentally drop the wrong student, click the ‘D’ again to reinstate the student. A dropped student has a red ‘D’ and their name is struck through on the roster. If the student previously paid for the course, they may contact support to submit a refund request. Support will determine if they fall within the refund policy guidelines. It is important to remove students who are no longer in your course, as it creates better groups within Mobius. A non-participating student creates no Submissions or Reviews and may work against the overall Analytics. On occasion, students will email Support directly asking to be dropped from a course, or if multiple sections use Mobius SLIP, to be switched from one course into another. In these instances, the Mobius SLIP Support Desk will Cc you, the instructor, to let you know of the change when the student’s course drop confirmation email is sent out. If you wish for a TA to receive emails about roster changes instead, please let the Support Desk know. To learn about adding a student after the course opens, please refer to the Enroll Your Students section. Whether students add themselves to the Course Roster late, by Self-enrollment or you add them, via Roster Upload, there are a few tips that lead to a smooth transition. Try not to schedule the first Submission deadline during the Add/Drop period. If the semester is short, a summer or winter term, or your school has an unusually long Add/Drop period this may not be an option. If it is possible, please do so. Students who add after the first Submission deadline will not be allocate to a group and will not be able to complete the assignment. Special consideration may be given on your, the instructor’s part, to grade their Submission external to Mobius. Careful with using previous assignment groupings during your assignment setup. If the first assignment must occur during a hectic time of Add/Drop consider basing your subsequent assignment groups on the second assignment. Students who add late and are not a part of the original grouping may receive errors in later assignments about not being in allocated to a peer group. If your grouping pattern is always random for every assignment, ignore this tip. Students must still pay before they can turn in any of the phases. If a student adds themselves or you add them to the roster, be sure that they know to make their Mobius SLIP course payment before attempting to complete their first assignment phase. Now that students have turned in their Permission SLIPs, it is time to relax and enjoy the ride. The next step Measuring Performance: Reviewing Content Analysis is coming up ahead.